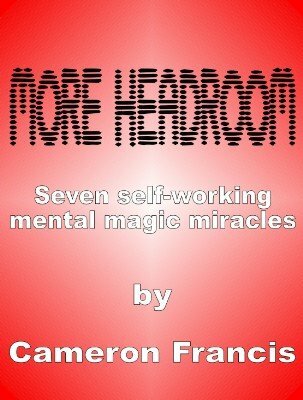 Cameron Francis presents seven more self working mental magic miracles using playing cards, business cards, bills, coins, envelopes, Sharpies and discount cards. There's a little something for everyone in this collection of super commercial, high octane material. RED LIGHT - An ungaffed version of Cameron's bestselling effect Red Hot Prediction. OUTLET - Four Sevens are shown. The spectator names one. You prove you predicted it. Clean and simple. CHANGE IT UP - A freely chosen number matches the amount of change in your pocket. MAGICIAN'S HOLD 'EM - A very easy to do and effective prediction of two hands of Hold 'Em. HUMMING WORDS - A fantastic word divination (and a great way to hand out some business cards!). D.M.C.A.N. - An easy and totally mystifying card at number prediction. Definitely a worker. WHO'S LAUGHING NOW? - A receipt prediction with a kicker ending. 1st edition 2011; 25 pages; photo illustrated.